When it comes to creating engaging social posts, compelling visuals are more important than ever. The sheer volume of images being shared across social networks each day suggests that, in order to stand out, creating unique visuals that are optimized for their intended networks and audiences is paramount to social publishing success. Adobe has long been the leader in helping people create high quality visual content, so to help brands streamline and enhance their visual publishing efforts, we’re excited to announce Sprout Social’s new image editor powered by an integration with the Adobe Creative SDK, available in Premium and higher plans. 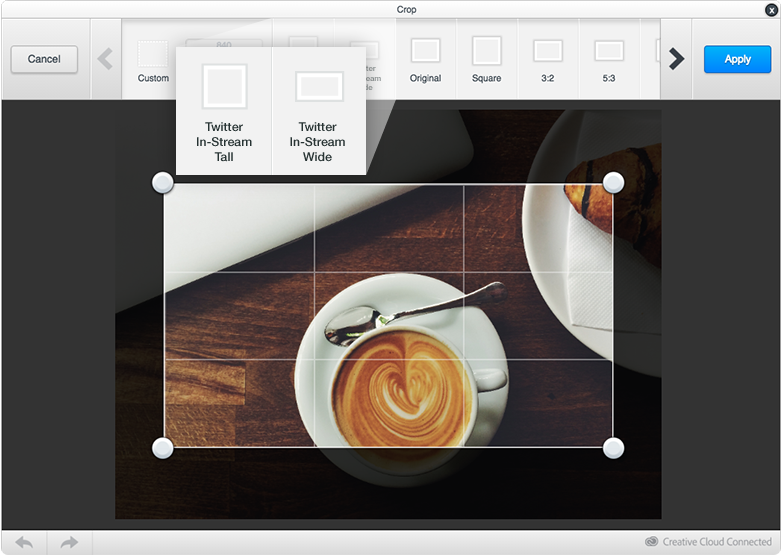 The built-in image editor gives Sprout users a bevy of tools to add effects, make adjustments and intelligently resize images directly from the Compose window. By integrating with the Adobe Creative SDK, Sprout’s Compose window now includes an image editor with tools to add filters, frames, text overlay and stickers as well as adjust color, brightness, shadows and much more. Upload an image using drag/drop or by clicking the camera icon. Hover over the image preview and click Edit. Use the photo editing tools to make changes to your original image. Making multiple edits to the same image is easy. Simply click Apply after using each tool, and when you’re all done, click Save. If you’re posting multiple photos to Twitter, you can make unique edits to each image. 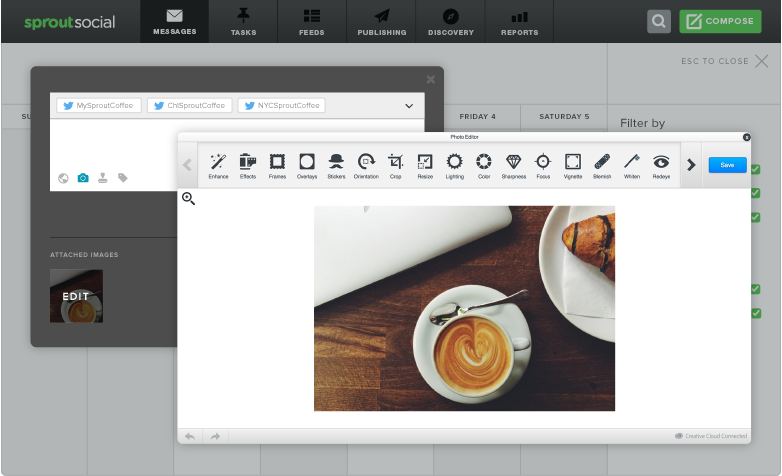 The Compose window’s existing features can be used in conjunction with the image editor to enhance your team’s publishing strategy. Use drafts and message approval workflow to streamline the creative process between design and content teams when adding and editing on-brand visuals in your social posts. Customize images for specific audiences with text-overlay and leverage Sprout’s organic targeting options to deliver unique visuals to the right audiences. Optimize your social media publishing strategy by tagging posts with specific visual edits and analyze that content’s performance with the Sent Messages Report tag detail. In addition to the image editing tools described above, the Adobe Creative SDK integration also includes tools to crop and resize your images. The default crop sizes include common dimensions like square, 3:2, 5:3 and so forth. To help you further optimize your images for each individual social network, we’ve added additional presets based on different network post types. 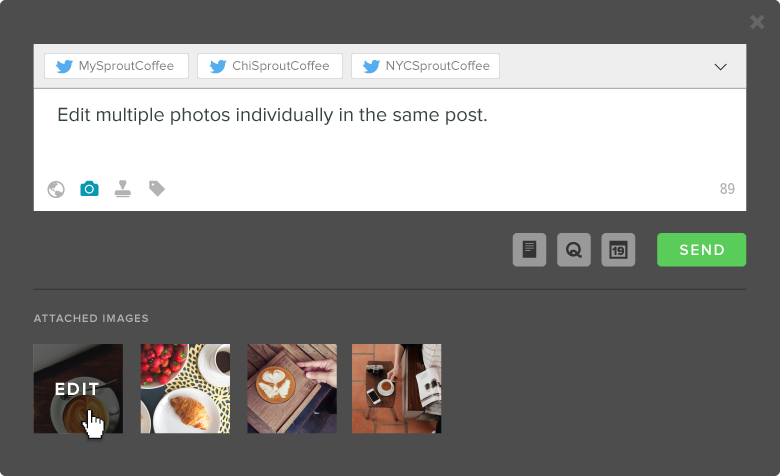 Powered by the same proprietary technology behind Landscape by Sprout Social, the crop tool will intelligently display the dimensions for relevant network post types based on the profiles/networks you have selected in the profile picker. When you match the Sprout Queue and scheduler, message approvals, tagging, and organic post targeting with photo previews, native video publishing, and now comprehensive image editing tools, Sprout’s Compose window truly brings together the tools and workflow necessary to create visually engaging social posts and deliver them to the right audience at the right time. Comment below or reach us on Twitter with any questions and stay tuned for more updates to our publishing suite in the near future.